Personalisation is a trend that keeps getting bigger. Not only does adding initials to an item give it the personal touch, it also makes it unique for your customers. And with hot foil machines you can easily customise anything from bags and belts, to wallets and Wellington boots, creating a high-quality, desirable product that’s one of a kind. Personalised items are a popular choice for internet shoppers, who can specify the words or initials they want when they order. This season, many Metallic Elephant hot foil machine users are selling gifts on Etsy, with some featuring in Not On the High Street’s Christmas Book. Of course, this isn’t the only time of year that personalised products sell well: monogrammed goods and customised merchandise are in demand all year round. Most products can be personalised with the use of a hot foil machine and jig (a fixture to hold the product in place). Our clients produce a variety of personalised products, including diaries, journals, bags, purses, cardholders, wallets, belts, stationery, phone cases, shoe insoles, slate and even Wellington boots. Although most items can be printed with a hot foil machine, there are some items that are not suitable for this type of customisation. Because the foil cannot adhere to them, glass and metal products cannot be stamped using a hot foil machine. Whatever words or initials you or your customers want, it’s easy to create them using a hot foil machine. 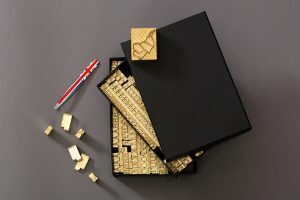 Individual brass type sets and pieces are made for each letter and punctuation mark. These can be produced in any lettering style or font, as long as it’s available as a TrueType (TTF) file. The letters are mirror images arranged in reverse, so for example to foil the word “hello”, you would insert the type thus: “olleh”. This ensures that when the dies and foil are pressed into an item, the letters will print and read correctly. The hot foil printing process is very simple; it involves bringing two surfaces together with heat and pressure. 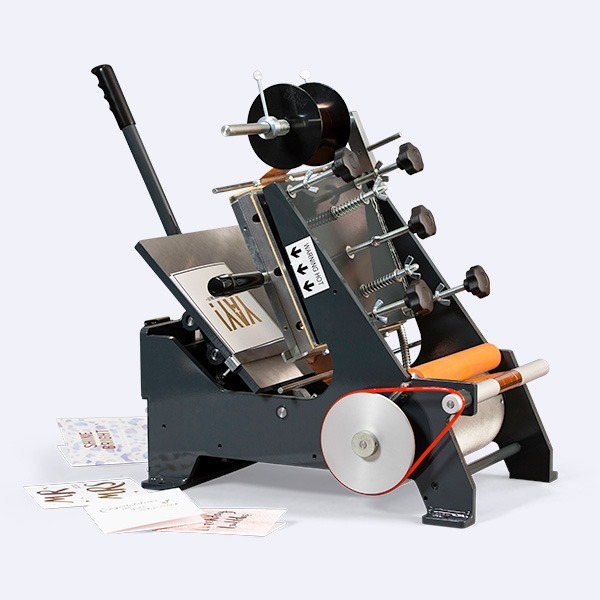 Once you have arranged the letters in the order required, all you need to do is to centre them in the hot foil machine, place them over the product you want to personalise, and – following the machine instructions – print. Bespoke monogrammed products printed with shiny foil are great for business. By producing your own high-quality personalised items, you can attract a new share of the market and keep your customers happy. Metallic Elephant are a boutique company supplying hot foil machines made to order. If you would like to know more about the hot foil printing process, read our blog on how it works or contact us for more information. We can advise you on the right hot foil machine, foils and accessories for your needs.